Steve's Navigator designed by John Welsford. 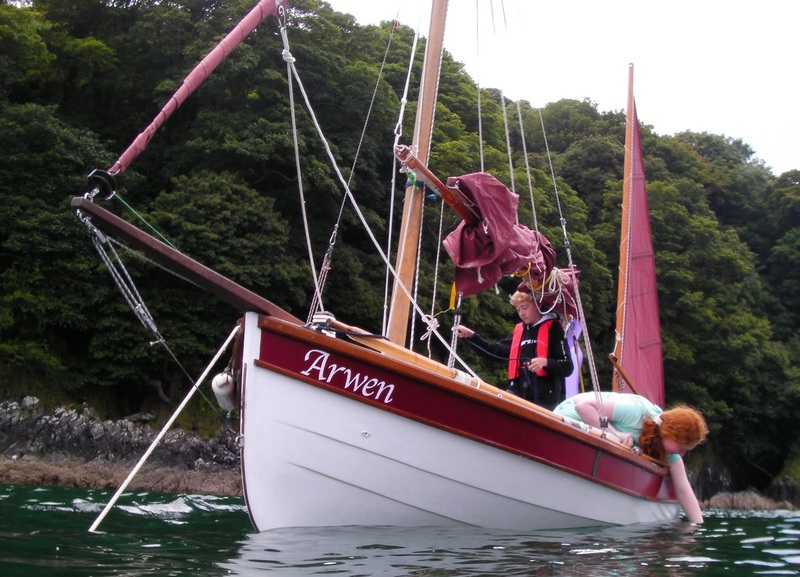 Click the photo to read more about how Steve built Arwen and got to grips with sailing on his blog. What was your sailing experience before taking up dinghy cruising? Many, like Steve had zero sailing experience. He built a boat in the evenings as a break from school teaching - and then learnt to sail her. Similarly, despite seven years "sailing” all over the world in the Royal Navy, Barry had never been in a dinghy. Others did other kinds of sailing first: Nick took up dinghy sailing at 30 and "raced at a local club for a few years before getting bored of going round in circles", while Alastair was a long-term motor-boater who occasionally crewed on his friends' sailing dinghies and yachts. Many "messed about in boats" as a child, some like Will, who went on to sail yachts to and from the tropics, never stopped; while others, like Osbert, returned to sailing in later life, only to realise that "being told as a child when to pull the jib sheet and when to change sides of the boat doesn't necessarily mean you can sail!" Liz however, never stopped: "As a teenager I crewed in racing dinghies at my local sailing club. I got a taste for camping on boats while sailing and camping in half-deckers on the Norfolk Broads. As a keen sailor and also a keen camper, it seemed natural to marry the two and camp in a boat." What did you need to learn, or develop experience of, when you took up dinghy cruising? While several people said their previous sailing experience equipped them for dinghy cruising, others felt they needed to learn new skills. Peter, who sailed as a child and later sailed yachts and gained his RYA Yachtmaster Coastal certificate, still considers himself a novice "having a fair amount of theoretical knowledge but not yet a great deal of practical aptitude". David made the point that it's not just skills that you need, but practice and experience: "You need hundreds of hours on the water. As a car driver you get this easily, but not so easily with a boat. You need to experience every possible mishap once under sheltered conditions. You need set-piece exercises in anchoring, heaving to, reefing, and navigation." Despite years of sailing experience, for some, dinghy cruising required completely different skills: Will replied "Camping! Never done it, no real idea how to go about it. Still don't really." Peter, who moved to dinghy cruising from yachts, pointed out that he "needs to be more 'wind aware' in a dinghy, and that 'everything happens fast' compared with a deep-keeled yacht." Barry was new to sailing when he purchased his first small boat, a 17 ft lateen rigged fishing boat: "after sailing two to three miles down the coast in half an hour and taking eight hours to get back, I realised that I needed to learn the principles of sailing", while Nick needed to relearn old habits: "in dinghy cruising it's safety first, speed second - the opposite of dinghy racing!" Having built his boat, Steve "needed to learn everything. I had no knowledge whatsoever other than that learned as a mountaineer regarding safety, weather, first aid and camping; I knew navigation reasonably well and so was able to transfer knowledge across to nautical charts etc." Like many others, tides and tidal currents were a steep learning curve for Alastair: "On the motor boat I was aware of them and could calculate them, but didn't have to take much notice of them. Now they were of prime importance. As I was sailing without a motor I had to learn a sailing mindset, timetables had to become hopes rather than certainties. If the wind or tide was not right I had to learn to relax and wait until they were rather than try to fight against them." How did you did you develop the skills you needed? Yes, you can learn to sail from a book: Barry "purchased a basic Teach Yourself Sailing book, and quickly understood the effect of wind on sail and lateral resistance of keel etc in the water. It is all a slow and enjoyable learning curve." Sailing courses have proved helpful starting point for many, but are not a panacea. David took took a two-day course on a Wayfarer: "I was 50 and found it quite frightening. I bought my Mirror and loved it at once - so easy to handle. As I found sailing quite intimidating, I have taught myself at my own slow pace. After a few months gradually teaching myself, and venturing further, I discovered the DCA." Many emphasised that courses alone alone are not enough. Peter took RYA Level 1 & 2 dinghy courses, and more recently the Seamanship and Day Sailing modules of Level 3, but still considers himself "as distinct novice - still learning". Sailing with others has helped many gain the skills and confidence for dinghy cruising - RYA rallies, and linking up with fellow members, are one way to find people to sail with. In an area with few dinghy sailors, and often no other boats on the water, Osbert was cautious, avoiding sailing in poor weather. Sail Caledonia, a professionally run 'raid' gave Osbert "a full week of sailing and rowing, it was a huge boost - I was out in conditions I'd never experienced, but with the comfort of support if things did go wrong. I now have much more confidence in myself and my boat to go out in - and enjoy - much more challenging conditions." ​But when it comes down to, regardless of courses and sailing with friends, one has to take responsibility for learning to cruise dinghies safely and enjoyably - we are all 'self taught' and continuing to learn. Advice and ideas from other sailors, in person and via the DCA forums and from reading widely all complement the essential practical experience of time on the water. What one piece of advice would you give to someone taking-up dinghy cruising now? Peter: "Make contact with the various DCA groups - go along and chat to people - also, most major dinghy types have their own groups, usually with both racing and cruising interests. The Wanderer Class Owners Group is both active and helpful." Steve: "Sail much more with other experienced people before you start off on your own - wish I had - most has been self taught by painful experience." Barry: "Keep it simple, a loose footed lug sail can quickly be dropped and stowed in a blow, or to get the oars out to get into that little creek. For sleeping on board: to start just rig some sort of cover for sleeping, find something to sleep on, an old blanket, deck chair mattress etc and pack some sandwiches and a thermos. You will soon find ways to improve all of this to suit yourself and your boat. For sleeping ashore, just take your normal, light weight, camping gear, and a good anchor for your boat." David: "Build up very gently. It is excellent to go to a rally just in the same harbour where you launched. Dinghy cruising will give you inspiration in your ordinary life." Anthony: "Start as soon as possible. You'll always regret not having started earlier." Alastair: "Don't be afraid of it, get out there and do it." Liz: "Try it! If the open sea worries you, try cruising on navigable rivers or canals or lakes. It doesn't have to be a sailing boat - you can cruise in a rowing boat, canoe or motor boat, but don't set out on the open sea without gaining experience in sheltered waters first." And Nick offers a different perspective: "Drive carefully, you are far more likely to die in the car on the way to the launch site than while on the water." What do you know now, that you wished you'd learnt earlier, about dinghy cruising? While many people mentioned the DCA, its rallies and forum, for Alastair "the inner peace of waking up in a secluded creek among the birds" was a revalation. While for Nick it was "simply how enjoyable it is!". David came to realise that "you should be professional, but you can afford to relax a bit. The dinghy will look after you." Osbert echoed this, "I wish I'd developed confidence in myself and my boat sooner." What sort of dinghy cruising do you do now? Where? Type of boat? Steve Parke: Welsford Navigator, a 14' 9" yawl, cruising around Plymouth sound and associated rivers; along the coast to Fowey or Salcombe. Nick: Tideway dinghy off Lincolnshire coast for day trips (at the moment), and weekends on the Norfolk Broads. Had the boat for a couple of years and am gradually building up experience and confidence to travel further afield. Alastair: Mostly short sails with overnight stops in the Chichester / Solent / Plymouth areas, with occasional longer coastal passages, in my Paradox microcruiser. William: Heron on Tamar. Only few trips a year with and without a toddler. Sometimes one-way trips with a trailer pickup. Just one overnight so far. Osbert: Welsford Walkabout on the Firth of Forth. Mainly day sails so far, but trying to find the time for some longer trips. Barry: I still take my West Wight Potter out in the Gulf of Mazarron Spain, and use my 18 ft Dart for day sailing, but I find I now spend more time on my Wharram Tiki 26 pottering around the Mar Menor Murcia. Spain. Not exactly a dinghy, but I sail it that way, no engine, simple loose footed gaff rig, can be handled by one person, deck tent, draws only 60 cm. so can get in where others can’t, using a paddle, quant, or hopping over the side and pulling. David: I still have my Mirror, and it has become part of me. I trust the boat absolutely in all conditions. I love going across to the IoW because it is a bit of real sea sailing and I can do traditional navigation. Peter: Wanderer dinghy, 1993 (S/N W1172) since last year. So really only just beginning to get to grips with the cruising scene. Certainly aim to link up with the various DCA Regional Groups, and the Wanderer Rallies. Also have a campervan, so plans are to use it to live in, but sail the dinghy weather permitting. Building and Sailing your own boat - Osbert Lancaster www.forthsailoar.osbert.org from Alastair Humphreys on Vimeo.